Layering for winter cycling is critical to staying warm and on the bike. It’s no secret that the key to being fit in the spring is riding through the winter, yet winter riding comes with the significant challenge of staying warm while getting in enough outdoor miles. Layering involves the tricky balance of retaining warmth and maintaining mobility. My old friend, Jerry Baker, used to say, “It is always better to be too warm than too cold.” Truer words do not exist for winter riding. You can’t add clothes you don’t have with you, but you can always take off a layer and stow it in your pocket or under your jacket if you are overheating. If you are too cold during your ride, you will get little fitness benefit from the workout because your body will be using most of its resources just to stay warm. You will get tired faster and your digits might freeze, resulting in shorter rides. Significantly, your muscles may never really warm up, such that your pace, breathing, and cadence never get up to a terribly beneficial state. While traditional layering methods work well here, fabrics play an important role as well. I employ different fabrics when ride temperatures land between 30-40 F versus those used in colder temperatures, really anything below 30 F.
Additionally, I use some surprising non-cycling specific garments to increase warmth and mobility on particularly cold days. Layering for winter rides can be a tricky equation. If you get your layers just right, your ride can be longer and more comfortable, but if you underdress, it will probably be shorter than you might like. Layering in autumn is different than for winter riding. In fall, I might wear a Craft Windstopper baselayer (unique due to its 2-layer construction, with a thin layer of Windstopper on the outer side) and a regular long sleeve jersey under a thermal jacket, but that’s just not enough for most Northwest winter days. For winter riding, the layering equation is much more complex, but once you figure out your system, it becomes easy to choose just the right garments every time. 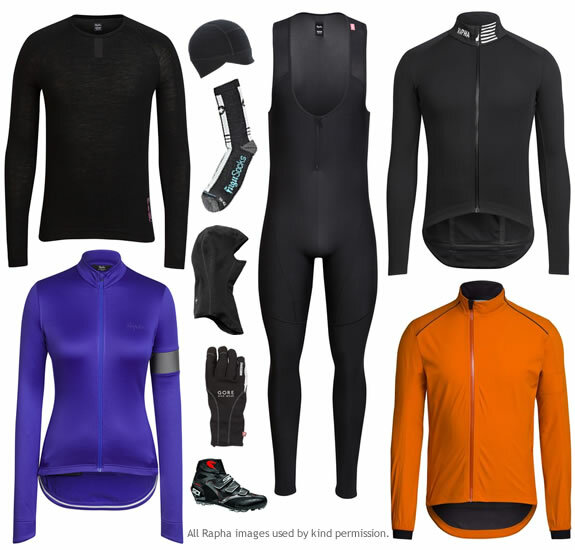 Modern winter cycling clothing is downright toasty and not too bulky – it’s pretty amazing how far fabrics have come in the last twenty years. In winter, I use a combination of Gore Windstopper, Gore-tex, Roubaix fleece, and merino wool garments. Having the right gear to know I will not freeze on a ride gives me great motivation for braving the elements. Gore Windstopper does what it says, not without fail but pretty darn close. It blocks the cold of most winds, except the most frigidly cold, when temperatures get down in to the 20s or less. I’d rather be sipping a hot cider at that point anyway. Windstopper brings flexibility and maximum warmth to the Gore line of fabrics, but it is not as flexible as Roubaix. It serves great as a second or third layer. Gore-tex is useful for your outermost layers, keeping you as dry as possible, though it has to be used in careful doses, in sections of garments rather than full wrap, otherwise the effort of cycling will cause overheating regardless of temperature. For instance, the best Gore-tex cycling jackets have panels made of other fabrics to allow for a healthy amount of breathability (or under-arm vents at the very least). Roubaix fleece is a thermal fabric used in bibshorts, tights, warmers, gloves, booties, and headwear. Roubaix is ideal as a second layer on top of merino wool. Its flexibility is quite good, better than Windstopper but not as good as merino wool. By the way, nearly any thin-walled soft fleece cycling garment will add to your warmth on the bike. Roubaix is perhaps the most common brand, while companies like Castelli use their own proprietary fabrics such as ‘Warmer’ fleece. Merino wool is perhaps the best baselayer available. Its insulating properties enjoy a well-deserved reputation. Even when wet, merino wool keeps you warm. Since the upper body houses the heart, it’s a good idea to keep your upper half as warm as possible on winter days. I generally start with a wool turtleneck baselayer, followed by a Roubaix thermal jersey, topped by a softshell thermal jacket, and finished with a Gore-tex shell. On the coldest of days, I wear three layers of warmness on my noggin, including either a merino wool cycling cap or a Gore Windstopper skullcap that covers the ears. I add a merino headband or second Windstopper layer that covers my ears a second time. On particularly wet days, I use a nylon cap that helps repel water and keeps rain off my glasses. I top it off, of course, with my helmet. Any time the temperature drops below 43 degrees F, I swap out the Windstopper skullcap with a balaclava, or slip on a merino wool neck gator. 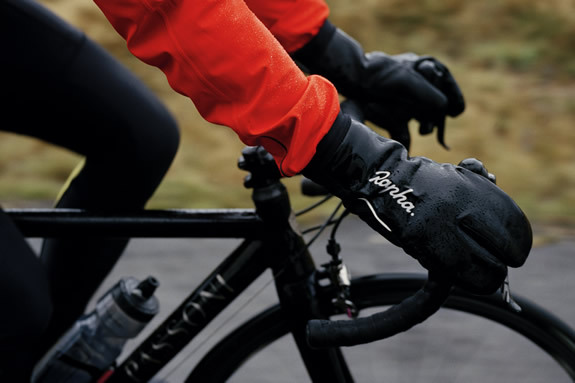 Rapha Overmitts are an excellently warm winter cycling glove. Courtesy Rapha.cc, used by permission. On my first team, Slug City Cycling, the older riders mentored the younger ones. One tip they shared back in the budget days of cycling (when virtually all bike racers were poor, skinny, pasta-eating, use what you can get riders), was picking up cheap thick wool gloves, from the army surplus store, for winter cycling. Worked like a charm, albeit, a heavy charm when wet. It’s important to note that your digits really need to be kept warm while riding in the winter, which means you should wear the thickest gloves and booties you can tolerate, and go with waterproof fabrics if you have them. Remember, you can always remove layers to cool off, but it is difficult to warm up cold hands while riding, especially if you left your thick gloves at home. If my fingers or toes start freezing, that’s the end of my ride; I have learned [see below] to turn around and head home at the first inkling of it. This usually happens only if I dress too lightly when the temperature is in the low 40’s or less, or if I stay out too long. I wear thick Gore-tex gloves with a fleece liner, lined Gore Windstopper, or lobster style waterproof gloves with a liner. Lobster gloves allow for the inherent warmth of keeping your digits closer together while allowing you some dexterity. On bitterly cold days, I add an additional fleece or wool glove liner. I go lighter on the legs because too much fabric friction can cause tendonitis at my knees, though I have known people who wore 3-4 leg layers. I wear thermal Roubaix fleece bib shorts and thermal Roubaix fleece tights to keep my mid-section warm. In the mid-20s to low-30s, I might add knee or leg warmers under my tights. Sometimes I wear knee-high merino wool ski socks too. This year, on sub-34F days, I added a pair of non-cycling merino wool leggings over my Roubaix tights, and found that, surprisingly, it eliminated any inkling of cold feeling from the wind without reducing mobility in the least. Sock selection is actually quite important because you need socks that provide enough warmth without so much heft that it cramps your shoes. Cycling shoes have to fit snugly, so you can clip out safely, and so that you have an efficient pedal stroke. Assos, Smartwool, and Castelli, among others, make thin merino wool cycling socks that allow you to slip snugly and comfortably into cycling shoes. If you are on a tight budget, you can also just slip your socked feet into sandwich bags or plastic wrap before putting on your cycling shoes. While the plastic will provide some wind and water protection, plastic bags don’t breathe at all, so I suggest this only on the coldest of days. If you have the budget for Gore-tex lined winter cycling shoes, get ’em. While none of these I have tried keep the rain entirely out, Sidi seems to have paid special attention to making their winter boots warm even when soaked through. Paired with a thick neoprene bootie and a winter wool cycling sock, feet stay warm. If your hands or feet start going numb, that’s your brain telling you to go home—now. The last time I ignored this important indicator, I wound up descending a 14-mile wet, twisty mountain road (in snow at the very top) without being able to pull the brake levers properly, while shaking like a crunchy leaf. I wound up with hypothermia and having to flag down a truck to beg for a ride, while wondering if I might find a nice place to nap in the gutter. (It was 61F when I began that ride, so I was woefully underdressed by the time I reached the top in 29F temps.) Do not ignore frozen digits! If you do find yourself freezing out on the road, go home and take a nice long hot bath. Then think about the next day’s ride in warmer clothes. One extra thing I do in winter to keep warm is use insulated water bottles. Although these are designed to keep your liquids cool during hot summer days, they also work in opposite conditions, keeping drinks at temperatures that do not discourage you from staying hydrated. Eventually, everything gets cold in frigid temperatures, but insulated bottles can help you stay out up to twice as long. Just like you should get a bike color you love, choose cycling clothing that gives you a little extra joy when you can. An orange jacket keeps you visible and keeps you looking like my team, whose colors are orange and blue. If all of your layers are the same size, they almost invariably will not fit well together, making you feel like a big insulated blob. Importantly, not taking size into consideration can also reduce mobility. You needn’t overthink it though. If you wear a size Large jersey and softshell thermal jacket, you probably will need an XL rain jacket, and may be able to get away with a Medium baselayer. I’ve used examples here of clothing I actually wear. While there is a plethora of brands and garments, I find a combination of Assos (in everything but their Mille sub-brand garments, which are more of a generous American cut), Rapha, Castelli, and Ibex fits me the best. There are different cuts, fabrics, and sizes for nearly any rider. Below are links to some of my favorites.